9:00AM SAT 2/3 - Current radar shows snow blossoming in the west. Advisories stretching awkwardly south across the eastern half of the state(image below). 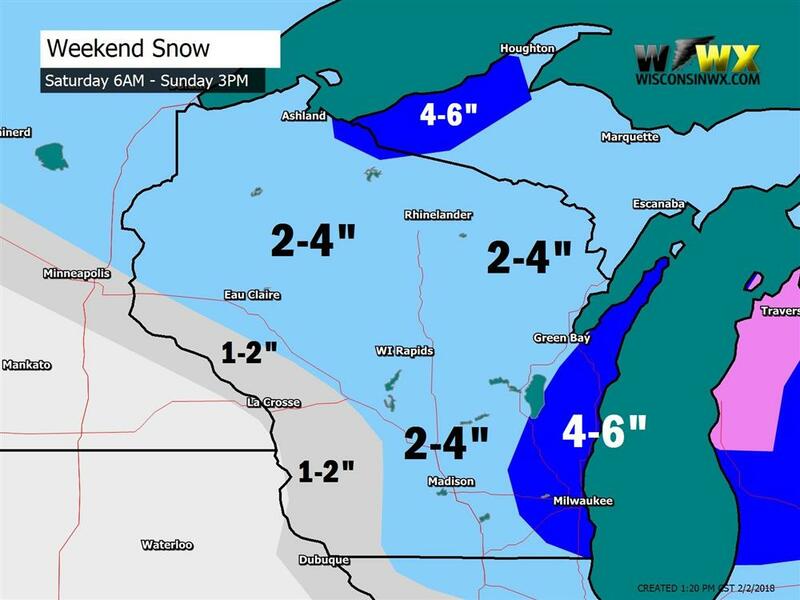 Made a couple changes for the final snow map, first to increase snow amounts in northeast Wisconsin. This brought predictions in-line with the NWS advisories. 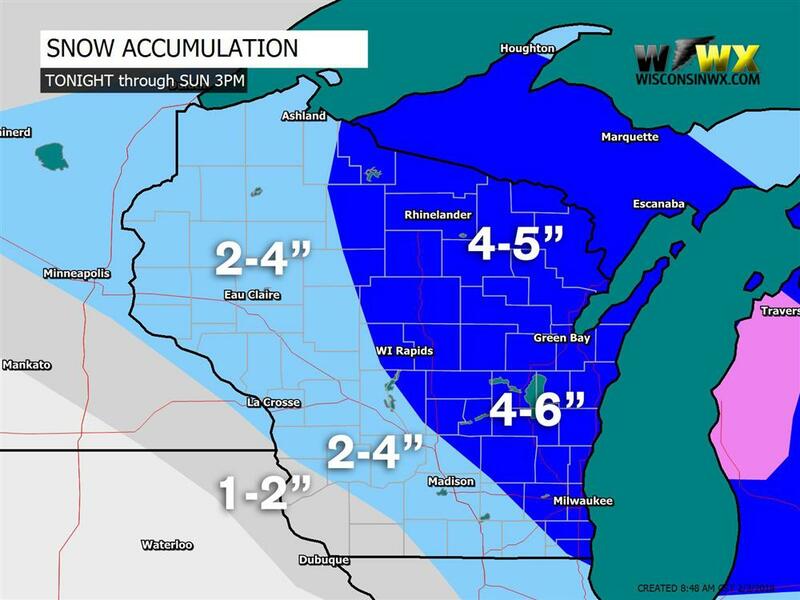 I'm expecting a broad region around 4-5" in northeast Wisconsin. The other change was to emphasize east-central Wisconsin where models have been highlighting for the most snow. Thought about 4-7", however didn't want to be conspicuous and agreement is not 100%. Less confident about snow accumulations in the far southeast corner of Wisconsin so trimmed it up a bit. Lock it in. Better be right! UPDATE 10PM FRI - NAM/GFS were generating a tad more QPF across northeast Wisconsin, plus support for slightly higher snow ratios near 22:1. This yields snow totals in the 4-6" range in northeast Wisconsin with pretty good burst of snow during the day on Saturday. Will make the change on the next update. Elsewhere I am okay with how things are lining up. Want to see EC and Canadian. UPDATE 2PM FRI - Forecast models are starting to hash out the details for this weekends snow chances. The big difference from yesterday is the separation of main precipitation events. Models shoved Saturday night north and enhanced Sunday morning. The estimate map I posted yesterday was not very good so hopefully this makes up for it. There is a chance for light snow tonight in northern Wisconsin. Dry air should dominate but the snow will help moisten the airmass a little. 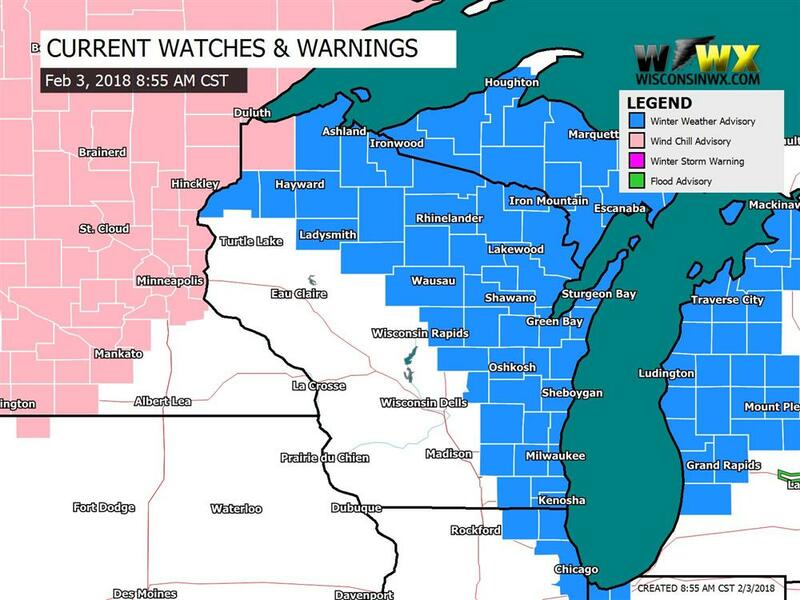 Widespread snow will start in northwest Wisconsin mid-Saturday morning spreading across northern Wisconsin by the afternoon. NAM suggests dry air could be tough to erase across central Wisconsin with best WAA forcing centered in the north, but will assume the GFS/EC idea for now. Saturday snowfall should be between 2-4" with locally higher possible in the northeast. This burst of snow will pass to the east Sunday night at the same time snow chances will be increasing for southern Wisconsin. GIF loop showing snow comes through in two pieces. 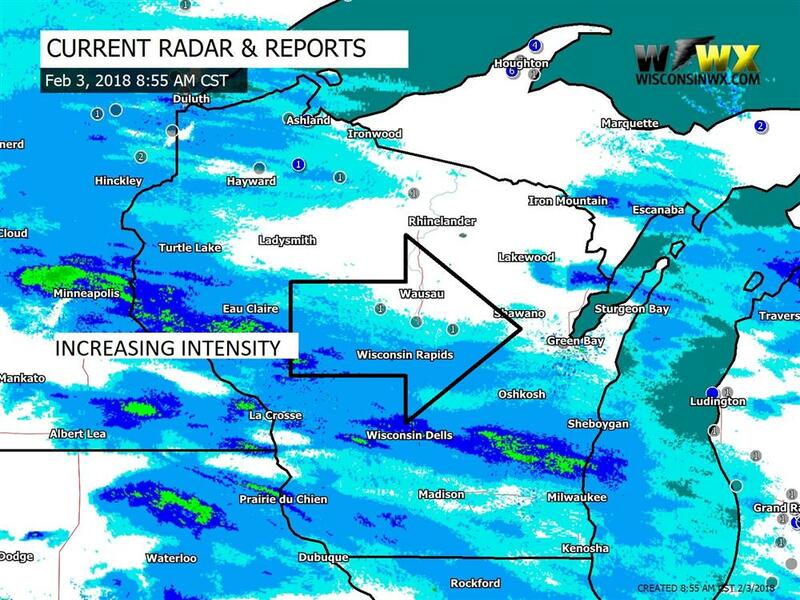 The snow in southeast Wisconsin has been looking more likely in recent runs. In southern Wisconsin, snow is most likely Sunday morning as upper level energy approaches, 700mb vorticity increases, and the low finally slips by to the south in a temporary deformation band-like setting. We are counting on the upper level energy to pass through in the afternoon keeping the door open for snow accumulation in the southeast, which could be several inches of accumulation. It's still around 36HRS out and would like to wait a couple more runs to be sure. The National Weather Service has already issued a Winter Weather Advisory. 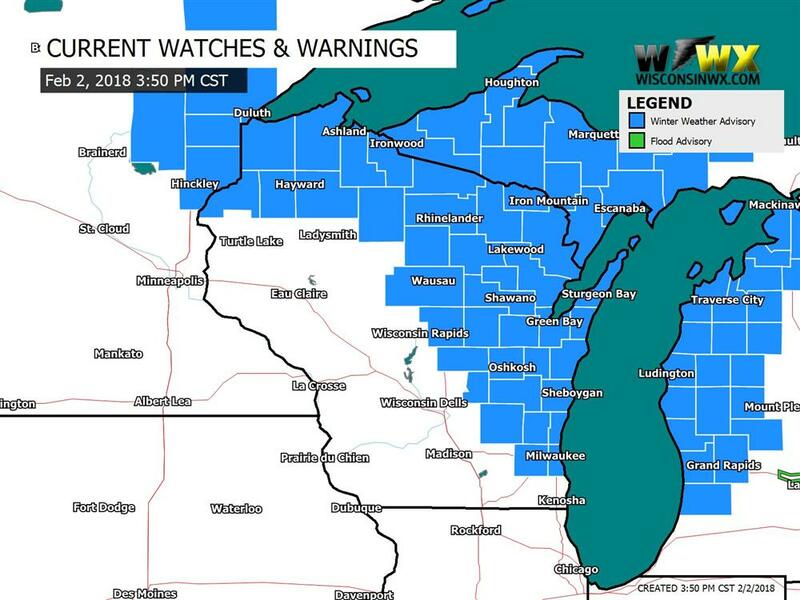 Winter Weather Advisories issued for eastern and northern Wisconsin. Not impressed with the lake effect potential since wind fields are pointing mostly offshore. There could be a few hours of lake effect, maybe more like "enhancement". Maybe that will be enough to push past the 6" mark in places like Sheboygan or Manitowoc? We'll see! Snow accumulation map. Will updated one more time on Saturday. Snow is in the forecast Friday night through Sunday. We are entering a quick hitting dynamic weather pattern for the first full week of February. Light snow may develop as early as Friday night in northern and central Wisconsin. There will be some dry air in place that will make accumulation hard to come by initially. The best chance for snow will be Saturday afternoon as a low pressure system rides along the frontal boundary. Several inches of snow accumulation is likely over a 24 hour period ending by Sunday afternoon. Question is exactly where? The pattern this weekend will be rather chaotic aloft with bundles of energy coming together (or not) above and south of the great Lakes. This will contribute to a tough forecast, not any less challenging that what we've seen this winter. I don't expect the weekend to go perfectly forecast-wise so we will take it one run at a time. Ignoring the Friday night snow chance for the moment, forcing for the main slug of precipitation will begin with WAA on Saturday. The vort max does not arrive until around noon Sunday, so snow is likely Sunday morning ending from west to east during the day. UPDATE 8:00AM FRI. Models shifted north in the runs since yesterday. More to come. The 12GFS/NAM bring 3-6" to portions of Wisconsin by Sunday PM but differ on location. GFS is slower and stronger and should the GFS be correct, the highest totals would fall in southeast Wisconsin. This assumes a max of 18:1 snow ratio. If snow event happens closer to the GFS I would probably decrease ratios a little bit. The NAM is further north. Canadian is weaker but looks similar to the GFS. 12EC was pretty much a blend GFS & Canadian, lighter on the QPF amount. Consensus on location is pretty close with NAM probably the outlier. Either way the Kuchera method is on the high side for this event. Should be a good opportunity for snow with WAA on Saturday night. Models also hinting at lake effect snow potential along the Lake Michigan shoreline Sunday morning. I want to see a few more runs on that. Sunday precipitation is understated, chances will be highest during the morning decreasing through the day. The weekend snow event will be surrounded by cold, both Friday and Sunday+ with below average temperatures. While it will be cold, we will escape the first two weeks of February without a major arctic outbreak instead favoring short lived bursts in dynamic northwest flow. Looks like we will have to wait until the end of February for the real cold (or maybe less cold by the time we get there!?). Less cold will keep the storm track overhead next week with mid range models showing frequent light snow chances as quick hitting clippers flow through. I am predicting a warm up mid-February. 500mb temps and storm track show major storms will come together downstream. We will still get the clippers. No massive blizzards but it should be snowy enough to keep us entertained. Just a reminder that you can always find 7 Day forecasts here, refreshed twice daily for "most" cities across Wisconsin!